04-25-11 –Spring – the season we live for, when all gardeners feel younger than their years, unless, of course, they are a young gardener. If you are in your twenties or thirties and already are hooked, inexorably, by this peaceful passion, good for you. We need you. 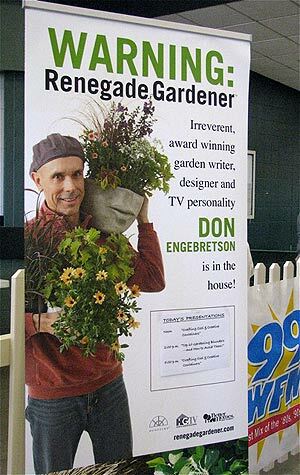 I have spent the past four months speaking to audiences of gardeners in seven states and one Canadian province, and am always delighted when I see people in the audience a decade or two younger than I. I love young gardeners because they sit in the front, listen intently, take notes, and believe virtually everything I tell them. Last summer in July I was bicycling past some stately homes in a pleasant Twin Cities suburb when I spotted an unfortunate scene. The homeowner had lined the sidewalk to the front door with Russian sage (Perovskia atriplicifolia) and it was just starting to hit its beautiful purple-blue bloom. The sad part was that unless some serious staking was to take place in the next few days, most of the blooms would be mashed underfoot; there was serious floppage taking place, such that the sidewalk was nearly covered with low-flying, vertically challenged sage. Too bad the homeowner hadn’t given the plants a good, stern shearing the first week of June. Left to its natural growth and development, the standard Russian sage tends to take a dive toward the tarmac regardless of how much sun plants receive. It’s by no means the only perennial that does so. Were you disappointed last summer by tall perennials that didn’t stay vertical once the weight of the foliage and flowers took hold (particularly after a hard rain)? Make note of the plants, and learn to shear. Shearing is simply reducing the height of a perennial in late spring to early summer. It’s not deadheading; shearing is done pre-bloom. It’s not tricky. You simply grab your hand bypass pruner (or hedge shears) and cut the plants down by half. You needn’t be particular about where you make the cut on each vertical stem, unless you want to. If you have only a few perennials to shear, you might take the time to cut each stem approximately halfway up, a quarter inch above a leaf stem. If faced with a giant swath of tall asters, boltonia, heliopsis, or thirty Russian sage plants lining a sidewalk, however, grab the hedge shears, eyeball the halfway point, and let ‘er fly. You can’t hurt the perennial. It will still bloom, and in fact needs to at the time in summer or fall that its genetics call for. What happens is that sheared perennials will hit bloom at about two-thirds their regular height, with stouter stems, such that the flop hazard is removed. Shearing can be done just about anytime in spring, from mid to late May for July and early-August blooming perennials, to early June for later August and fall bloomers. The classic case of shearing is the pinching of Chrysanthemums. Mum lovers have long known that pinching mums down by half in early June, then pinching new tip growth again in early July results in lower, stouter, more heavily blooming plants come fall. Again, pinching of mum stems between thumb and forefinger just above a leaf set is fine if you have the time, but you can go guerilla. My father loved mums, and grew dozens of them. He also loved summer vacations at the cabin, and on more than one occasion I witnessed him wading through his mum beds with a small, double-edged grass scythe, swinging wildly away, “pinching” his mums in half moments before hopping into the station wagon for the family trip north. Shearing is also useful if flopping isn’t the problem, but final height is. You may have planted a daisy-like perennial such as leucanthemum near the front or middle of the garden, and are disappointed that as the clump has grown, the plants in flower are too tall, blocking the plants behind, or in general appearing out of scale. Before moving the clump, try shearing it next spring to see if it doesn’t settle down and settle in. If you have a deep clump, something such as Boltonia or fall Asters, where the plants have expanded so that the mass of them is several feet or more from front to back, you can shear the front half of the plants a bit below halfway in height, then shear the back half a bit above halfway. It’s an old English gardening trick, where once the plants bloom, instead of the entire clump being the same height, they rise in height from front to back. A final note – the time frame for shearing described above is based on my USDA Zone 4 experience. You can certainly move “shearing time” up a week or so in Zone 5, two to three weeks in Zone 6, probably damn near a month for you cheaters in Zone 7, and for Zones 8 and 9, well, cacti don’t need shearing.